Rachel Zakuta’s online adventure game Reckless Space Pirates, was published by Choose Your Own Game in April of 2014. In this game, you have been kidnapped by space pirates on their way to a forbidden planet. 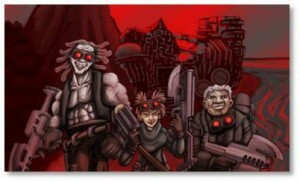 Will you join them and plunder an alien colony? Or will you resist, and save the aliens from the rampaging pirates? (You can download Reckless Space Pirates for very little money at the App Store, Google Play, or Amazon). An explanation of how Rachel wrote and edited this game and worked with the folks at Choice of Games to get it published was detailed on The Next Phase blog’s post: You Can Choose to be a Reckless Space Pirate. The members of SpaceCrafts were part of the editing process and we all played the game multiple times as Rachel developed it. We’re thrilled for Rachel as Reckless Space Pirates goes live. We had fun. You will, too.